Algonquin's defense had a stellar debut against Nashoba, ending the Chieftains' 17-game winning streak. Algonquin’s defense carried the Tomahawks to a 13-7 home win over the defending Division 2 State Champion Chieftains of Nashoba Regional High School. In a defense-heavy game, Nashoba’s only score came on a kickoff return for a touchdown, and Algonquin’s only touchdown was set up by an interception return. Although Algonquin (1-0, 1-0 Mid-Wach B) came out on top, Nashoba’s (0-1, 0-1 Mid-Wach B) defense made plays early in the game. Sophomore defensive back Troy Barksdale recovered a Tomahawk fumble on the first play from scrimmage to set the Chieftains up at the Algonquin 34 yard line. Algonquin’s defense kept Nashoba’s offense out of the end zone, as they would do so throughout the night. Algonquin head coach Justin McKay was pleased with how his team responded to the early adversity. “I was really proud of the resiliency of our team,” Coach McKay said of his team’s ability to put the first-possession fumble behind them. As the two student sections exchanged enthusiastic chants during the first eleven minutes of play, the two teams on the field exchanged zeroes, and there was no score at the end of the first quarter. On the first play from scrimmage in the second quarter, senior wide receiver and defensive back Patrick Duffy made the biggest play of the night for the Tomahawks. On third and long with the ball deep in Nashoba territory, Chieftain quarterback Owen Fay threw the ball down the far sideline into double coverage. Duffy made a leaping interception and returned the ball to the Nashoba five-yard line. “That interception changes the field position, changes the momentum, and it’s a great play by Patrick Duffy,” McKay said. Two plays after the interception, senior running back Max Cerasoli escaped to the outside and ran untouched into the end zone. Johnny Polymeros’ extra point gave Algonquin a 7-0 lead just 52 seconds into the second quarter. “When we score first, that’s big,” Algonquin assistant coach Mark Allen said. After scoring first, the Tomahawks regained possession when their defense forced a four-and-out. “When the defense gets a big stop to get the ball back to the offense, that’s a big help,” Allen added. Algonquin’s offense stayed on the field for the remainder of the first half. Senior quarterback Ryan Barry completed passes to Brett Sherman on two fourth-down conversions to keep the drive going. The drive culminated with a field goal by Johnny Polymeros as time expired, giving Algonquin a 10-0 lead heading into halftime. After intermission, Nashoba began to generate some offense by giving the ball to Jake Fire, a 205-pound senior fullback. The offensive line helped Fire pick up two quick first downs. The Chieftains were penalized for holding on a first-and-ten from the Algonquin 38-yard line, and the drive ended when Algonquin lineman Jake Walker sacked Fay on fourth down. Algonquin began to move the ball methodically down the field as time wound down in the third quarter, running and passing the ball over the middle of the field. Cerasoli picked up eleven yards on a fourth-and-one to set up Algonquin with a first-and-goal from the Chieftain four yard line. A holding penalty against Algonquin pushed the Tomahawks back to the Nashoba fourteen yard line, and the Chieftain defense held Algonquin to a field goal. Polymeros converted the kick to give Algonquin a 13-0 lead with 8:55 remaining in regulation. 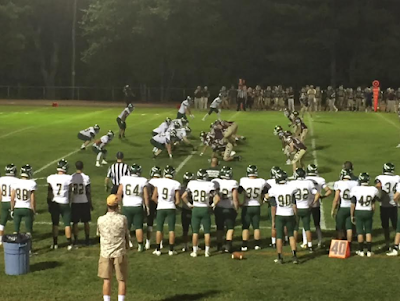 Senior running back Nate Mansour provided a spark to Nashoba, returning the ensuing kickoff for a touchdown. The extra point made the score 13-7. Algonquin could not move the ball against the energized Nashoba defense, and it looked like Nashoba would have the ball and the momentum after just four plays. However, a personal foul against Nashoba on a third-and-ten play from the Algonquin 45 yard line gave Algonquin fifteen yards and a first down. Nashoba reclaimed the ball with 3:55 remaining, but Algonquin’s defense continued to stifle the Chieftains. Nashoba was forced to punt from their own 21-yard line with 2:48 remaining in the fourth quarter. After Nashoba called three timeouts, Algonquin senior running back Alec Looby picked up a first down to seal the deal for the Tomahawks. Although Coach McKay is proud of his team, he said he wants the Tomahawks to continue to be resilient, and to continue to grow and improve as the season progresses. Algonquin’s next game is on Friday, September 16th at Marlborough at 7:00 PM. Nashoba will look to return to their winning ways from last season in their home opener on Friday, September 16th against Shrewsbury at 7:00 PM. Two things I think worth mentioning , don't know how you missed giving the Algonquin O-Line credit for the holes they created for our running backs . Also don't know how you missed the play of Algonquin Linebacker #44 Leva who had a sack , caused a fumble and a few tackles . Haha, I think Jason wrote a pretty extensive and detailed story, actually. Can't mention every single thing that happened, but he definitely got across that the T-Hawk defense played well. I'm sure the O-line played well too, but in a low-scoring game I probably would've focused on the defenses, special teams and turnovers as well.